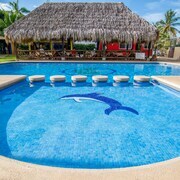 Situated in Playa Flamingo, this lodge is within 3 mi (5 km) of Flamingo Beach, Conchal Beach, and Playa Brasilito. Penca Beach is 2.9 mi (4.7 km) away. Nice experience, very friendly, and the grounds are colorful and real nice. We stayed in a Villa, the bathroom was outdated but overall very clean and nice. Highly recommended! Where to find Playa Flamingo hotels near an airport? Where can I find hotels in Playa Flamingo that are near tourist attractions? 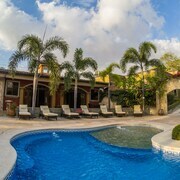 If you're thinking of planning to stay in the Guanacaste - North Pacific Coast region and you want to book short- or long-stay accommodation in Playa Flamingo, you'll find an extensive array to select from. About 24 hotels and apartments can be found within a 0.1-kilometre (0.06-mile) radius from Playa Flamingo's center. Convenience is everything when it comes to stress-free vacationing, so check out the Flamingo Beach Resort & Spa and Flamingo Marina Resort, all of which are within a 1-kilometre (0.6-mile) radius of downtown Playa Flamingo. 25 kilometres (14 miles) away from the heart of Playa Flamingo, is the Four Seasons Resort Costa Rica. The Naxos Condominium is positioned 17 kilometres (11 miles) away. 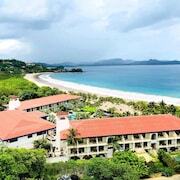 Other places to stay around this area include the Crystal Sands and the Andaz Papagayo Resort - a concept by Hyatt. Looking for more things to do? Consider spending a day or two discovering Safari Surf School and Frog Pad, in Nosara, 55 kilometres (34 miles) to the south of Playa Flamingo. 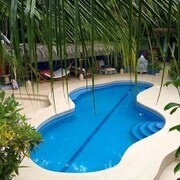 Should you wish to visit Nosara, check out the room rates at the The Harmony Hotel and Villa del Sol. 3 kilometres (2 miles) to the south of Playa Flamingo, is Conchal, which is home to the The Westin Golf Resort & Spa, Playa Conchal - All Inclusive and Reserva Conchal. The Playa Conchal and Adventure Divers are some of the most popular attractions to check out should you visit Conchal. If you are into sports and enjoy watching games you could take a trip to Tronadora Arena, which is 95 kilometres (59 miles) to the east of Playa Flamingo. Those wishing to stay close to the action can make a choice from the Hotel Puerto San Luis or the Lake Arenal Hotel & Brewery. Daniel Oduber International Airport is a logical airport, and is located 35 kilometres (21 miles) away from Playa Flamingo. Expedia-listed hotels close to Daniel Oduber International Airport include Hilton Garden Inn Liberia Airport and Hotel Rincon del Llano. What are the most popular Playa Flamingo hotels? Beachfront Palms Villa on Flamingo Beach - Private Home at 5 Star Resort! Are there hotels in other cities near Playa Flamingo? What other types of accommodations are available in Playa Flamingo? Explore Playa Flamingo with Expedia.ca’s Travel Guides to find the best flights, cars, holiday packages and more!